PUBLISHER / EDITOR Wili Liberman ASSOCIATE EDITOR Lisa Tran ASSISTANT EDITOR Raenu Sarathy EDITORIAL INTERN Isabel Ottoni CONTRIBUTORS Lisa Gay-Milliken, Adam Stone, Lex Talamo ART DIRECTION/DESIGN Kat Bezner EDITORIAL ADVISORY BOARD Bernice Slotnick Teacher (retired) John Myers Curriculum Instructor, Ontario Institute for Studies in Education/ University of Toronto Rose Dotten Directory of Library and Information Services, University of Toronto Schools (Retired) www.teachmag.com TEACH is published by 1454119 Ontario Ltd. Printed in Canada. All rights reserved. 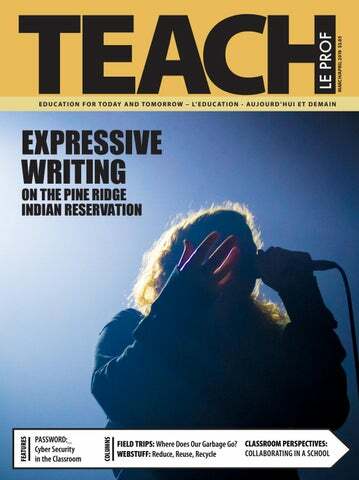 Subscriptions are available free of cost by writing our office, 1655 Dupont St., Suite 321, Toronto, ON M6P 3T1 E: info@teachmag.com T: (416) 537-2103 or sign up for our newsletter at teachmag.com. Unsolicited articles, photographs and artwork submitted are welcome but TEACH cannot accept responsibility for their return. Contents of this publication may be reproduced for teachers‘ use in individual classrooms without permission. 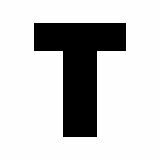 Others may not reproduce contents in any way unless given express consent by TEACH. Although every precaution is taken to ensure accuracy, TEACH, or any of its affiliates, cannot assume responsibility for the content, errors or opinions expressed in the articles or advertisements and hereby disclaim any liability to any party for any damages whatsoever. Canadian publication mail sales product agreement No. 43579512. ISSN No. 1198-7707. No minimum order • FREE shipping • FREE sales supplies • No up-front cost All products guaranteed • Expert help every step of the way For the last 40 seasons, schools and organizations across Canada have raised millions & millions of dollars through our fundraising program. One of the main reasons for this great success is the fact that there is no risk and no up-front costs to the participating organizations… what could be better! Explore the Complete Story of the Canadian Suffrage Movement through a historic grapHic novel A true story of how Canadian women achieved the vote in a dynamic and interactive format that delivers a compelling learning experience. The evocative illustrations recreate the span of time representing how long women struggled to attain the vote and the many challenges they faced. "I don’t understand why I am here on this earth. I don’t understand why God made this mistake." and password, and all of their content follows as well,” he explains. “Students no longer need to remember which iPad is theirs. Simply grab any available device, sign in with your unique user name, and you’ll feel right at home.” Password managers like LastPass perform a similar function. A user can enter a master identity and the manager will keep track of—and automatically populate— user names and passwords across a range of applications. Managers like this offer a handy fix in environments where students are required to manage multiple passwords across diverse devices and applications. “A password management application will enable you to create unique, high-strength, randomly generated passwords for every website and application you use,” says Craig Lurey, CTO & Co-Founder of Keeper Security. “You don’t have to remember each individual password—just one master password.” …BUT NOT ALL PASSWORD MANAGERS While tools like LastPass are not bound to a single device, other password managers can be more limiting. Web browsers for instance will frequently offer to store a user’s credentials. This may seem convenient, but on shared machines it becomes problematic. “When Chrome offers to save the password, I always tell the kids to say no,” Randash says. “I have six computer classes going through here every day, that’s like 300 kids, and you never want your password saved on something that someone else is going to use.” REMEMBER THE BIG PICTURE When it comes to password management, convenient log-in is important, but that’s not the end game. In the big picture, a robust password management program is part of the larger effort to educate good cyber citizens. “We spend five weeks on it at the beginning of school, talking about internet safety, safe places to visit on the internet. As part of that we talk about passwords and privacy,” Kimberly Bachmann says. “We want to teach them that changing your password is part of good digital citizenship, it’s how you keep your information protected. We want them to have these good habits when they start using the Internet to buy things. That means we can’t just talk about it. We have to show them. We have to take them through the process.” A seasoned journalist with 20+ years' experience, Adam Stone covers education, technology, government and the military, along with diverse other topics. webstuff Reduce, Reuse, Recycle April 22 is Earth Day, which may be a good time to tackle some environmental issues in the classroom, for example, recycling. A great way to start is by showing students that recycling is much more than sorting paper, plastic, metal, or glass. Instead, it’s a complex process that involves city management and every citizen in their home, school, and place of work. Here are some websites and resources to help you and your students learn more about recycling. This post by the We Are Teachers website shares 30 unique crafts using recycled materials. Find pictures and videos on how to make beautiful crafts, like a hanging garden, and superhero cuffs. Students will also learn how to make their own games, like portable tic-tac-toe, and decorative items, such as a sun catcher. To browse this free resource, visit: www.weareteachers.com/ earth-day-crafts-classroomactivities. This app for young students is a great way to discover the sights and sounds of a typical neighbourhood on recycling day. Users will follow a recycling truck as it drives through the streets. They can help the driver pick up the recycling cans and unload the truck at the Recycling Sorting Center, where they sort materials by either paper, glass, metal, or plastic. Children can also tap on people, animals, or objects in the city to play a sound or perform actions. Find it on App Store. This website offers a variety of resources for teacher and students, for example, a school resource kit on how to implement a waste reduction action plan and a helpful flyer on how to pack a waste-free lunch. To learn more, visit: wrwcanada.com/ en/get-involved/resources/ tool-kits/schools. From the US Environmental Protection Agency, this website features a fun way to learn about the recycling process in a city. Students are able to explore Recycle City and its different neighbourhoods and buildings, as well as, play games like Recycle City Challenge and Dumptown Game. Teachers can find a good source of recycling exercises in the Trash and Climate Change Activity Book, available as a PDF. To find all these resources, visit: www3.epa.gov/recyclecity/ index.htm. Do you remember the first time you entered the school library as a child? I do. There were books everywhere. The librarian told me that I could borrow any of the books and take them home. Amazing! This excitement continued throughout the years. I couldn’t wait for book fairs. I joined the audio-visual club. I still was able to check out as many books as I wanted. Fast-forward 16 years later. I accepted my first teaching position. I was a special education teacher in a public high school and there was a beautiful school library. The librarian, Cleo, was remarkable. I fondly remember her creating a special bookshelf for my students who were significantly challenged, to assist them in finding books easily. It was a rewarding 15 years with Cleo; therefore, I assumed that all students and teachers have similar experiences. Unfortunately, I was wrong. There is no library in my current school. Today, I work in a private day school in Virginia. Special education students who are not successful in their home school, due to challenging behaviors, come to us by way of an Individualized Education Program (IEP) team decision. The students are still “owned” by the public school yet are unwanted in regular schools. In private, specialized day schools, we open the door to academic success by focusing on new ways of interacting with students and teachers. The challenge is to make learning fun again while acquiring the skills to deal with any behavior that holds them back from attending a public school. The ultimate goal is always to get the student back to their home school as soon as possible. We are constantly communicating and collaborating with the public school special education teachers and case managers. The funding is limited in a private day school; therefore, there are no libraries in our school buildings. We have a room with some books that have been donated by the local Moose Lodge and Ruritan club (local organizations that do charity work), but that is not enough. Private day school students need and deserve a library as much as their peers. So, why are we not using the public school library and collaborating with the librarian? Barriers to Collaboration Recently, I went back to school to earn my school librarian endorsement; therefore, the topic of collaboration resurfaced for me. I found myself seriously considering the reason for this forgotten private-public collaboration with a public school librarian. Some potential barriers: •	Travel time could certainly be a problem. A private day school is in a separate building. The school accepts students from surrounding cities and counties. Several students are on the school bus for well over an hour. •	Whether it is the public school librarian traveling to the private school or the students being transported to the public school, transportation could be costly. •	The students in the school may have challenging behaviors. Perhaps these behaviors are remembered and there is a reluctance to allow the student back in the school library? •	School administration is not supportive of the collaboration. •	Lack of technology to support virtual collaboration. Laurier and the Francophone Question Wilfrid Laurier grew up in a world that was comprised of two solitudesâ&#x20AC;&#x201D;distinctly English and French communities that coincided but rarely interacted in substantive ways. Wilfridâ&#x20AC;&#x2122;s father, Carolus, knew this situation remained problematic and actively encouraged his son to immerse himself in English culture. Wilfrid spent time in New Glasgow living with a family of Scottish heritage, where he learned to read and write in English and gain insight into English attitudes and ideas. Throughout his political career, Wilfrid was able to forge compromises and settlements that accommodated both sides of a given issue. This approach served him well for a long period of time, and he remained very popular even when he and his party were out of favour. There were times when his approach to policy and decision-making appeased neither side and in some instances, served to inflame tension and conflict. Perhaps, in the end, Wilfrid could not deny that he was a Francophone first, as his objection to conscription during the First World War, for example, cost him that final election. The issue, one of many that divided the French and English communities, is indicative of the differences in attitude and sensibility between the two. Students will come to understand the state of FrenchEnglish relations during Wilfrid’s lifetime and more importantly, his lengthy political career. Wilfrid saw himself as one to unite the two communities but that didn’t always come to pass. For many years, Canada functioned exclusively as a British colony and Wilfrid grew up as the country was beginning to throw off the binds of colonialism, although tension between French and English continued. During Wilfrid’s life and political career, certain events took place that widened the schism between French and English. As a result, Francophones across the country felt aggrieved at the hands of the Anglophone majority following crises such as, the Red River Rebellion (18691870), the Manitoba Act (1870), the 1905 Act, and Ontario’s Regulation XVII. Even in Quebec, where the Francophone population constituted the majority, these attacks made clear that ties to Britain and English rule remained strong and intransigent, widening the gap between the two communities. Since the days of Robert Baldwin and LouisHippolyte LaFontaine—the architects of Responsible Government—efforts to forge a truly bilingual nation where Francophones existed as equal partners in a political union, had been tried and tried again. Wilfrid, when elected to the federal parliament, walked into a kind of minefield. Yet it is entirely likely that only Wilfrid, with his background, upbringing and perspective, who had the instincts of a conciliator, might have negotiated such a hazardous path. And negotiate it he did for a long period of time. But even the “Great Conciliator” had to admit defeat eventually. Wilfrid, for example, startled his law school classmates and guests when, as valedictorian, delivered his speech entirely in French. This had been rarely, if ever, done. EXPECTATIONS/OUTCOMES The overall expectations listed below serve as an entry point for teachers. Teachers are encouraged to make connections to specific expectations in their region and grade. Students will: •	Increase their knowledge of early FrenchEnglish relations; •	Analyze the social, and political implications of different political events and their impact on French/English relations; •	Understand Wilfrid’s early influences and how they informed his political career; •	Explain how certain key events and personalities affected Canada’s FrenchEnglish relations and how that might have changed if Wilfrid had taken another path; •	Demonstrate an understanding of the political times in which Laurier lived; •	Describe the relationship between French and English communities at the end of Laurier’s career and now, and; •	Communicate their ideas, arguments, and conclusions using various formats and styles, as appropriate for the audience and purpose. TEACHER-DIRECTED DISCUSSION Divide the class into teams and assign one of the events listed above as a topic of discussion. Without referring to any notes or previous research, have the teams list what they know of the event they’ve been assigned. Have each team, in a round robin format, read out the information they have discussed for each event. Make notes on the board, tablet, whiteboard, etc. Then have the teams research the event they’ve been assigned and subsequently, read out loud what they have discovered. Each presentation should be about five minutes in length. Add more detail to the previous notes made for the class using whatever method is common. Are there any preliminary conclusions the student teams might draw from the points that have been made? Can they encapsulate the event they’ve researched and its importance to French-English relations at that time? UNDERSTANDING WILFRID Have students connect Wilfrid’s actions to the event they have researched. Would they say he acted in a responsible manner, in the sense of being a responsible citizen and letting the principles of citizenship govern his actions? Or, perhaps not? Were Wilfrid’s actions important and significant and if so, how? Students will write a 1-2 page essay on Wilfrid’s attitudes, thoughts and actions regarding the event in question. Is there something he might have done? Was Wilfrid mindful in his approach in response to the event? Did his actions have outcomes and/or consequences? If so, have students list these in the papers they write. The assignment will be given to the teacher for assessment upon completion. authority of the Queen? No, never. His whole crime and the crime of his friends was that they wanted to be treated like British subjects and not bartered away like common cattle. If that be an act of rebellion where is the one amongst us who if he had happened to have been with them would not have been rebels as they were? Taken all in all, I would regard the events at Red River in 1869-70 as constituting a glorious page in our history, if unfortunately, they had not been stained with the blood of Thomas Scott. But such is the state of human nature and of all that is human: good and evil are constantly intermingled; the most glorious cause is not free from impurity and the vilest may have its noble side.” The above quote exemplified Wilfrid’s conciliatory approach to tackling significant issues. He supported Riel and his position at the time, questioned the government’s handling of the Riel question and ended up supporting a compromise version of the exile that was imposed upon him, versus the complete exoneration that many Francophones supported. What if Wilfrid took an opposing view to the one quoted above and for which he was famous? What would that look and sound like? Have students draft up an alternate version of Wilfrid’s support for Riel up to two pages in length. These opposite approaches will be written out and read out loud to the class. Students must be able to justify the particular approach they’ve taken. They must also be available to discuss what they learned about Wilfrid as a result of going through this process. CULMINATING ACTIVITY Using the graphic novel as a guide, students will write a short story that explores Wilfrid’s struggle to reconcile his Francophone background, upbringing, and culture with the overwhelming desire to appeal to all Canadians and present compromising views and platforms on important issues. As an alternative to the short story, students may also write diary entries written from Wilfrid’s perspective that explore this issue of walking the line between English and French relations while attempting to co-opt the support of the majority, to find that middle way through very tricky issues he faced. The short stories/diary entries will be submitted for assessment. The teacher also has some flexibility as the short story may also be illustrated or drawn, like a graphic novel for those students who prefer the visual versus the literary approach. OPTIONAL EXTENSION ACTIVITIES •	Have students turn the short story/diary entry they completed into a one-act play or monologue. Students will rehearse and perform the one-act plays for the rest of the class. •	Using quotes from famous Canadian personalities and politicians (William Lyon Mackenzie King, Pierre Elliott Trudeau, Sir Robert Borden, Tommy Douglas, Joey Smallwood, Agnes McPhail, Emily Stowe, etc., replicate the exercise where students take the opposite view or stance on a particular issue. For example, what if Emily Stowe didn’t believe in or support the Canadian suffrage movement? How might that view be portrayed? Students must be able to justify the approach they take. •	The student debate: have students form into debating teams. Here is the question to be debated: Be it resolved that Louis Riel was unfairly treated by the government of the day and never should have faced the death penalty. One team shall take the Pro side and the other, the Con side. Formal debating rules will be followed: www.edu. gov.mb.ca/k12/cur/socstud/frame_found_sr2/tns/tn-13.pdf. Those class members not on the two teams will act as judges and select the winner of the debate. The teacher shall act as moderator. •	Opinion piece: Students will write an opinion piece evaluating the legacy of Sir Wilfrid Laurier. Wilfrid is generally revered as a great orator who worked to bring the French and English communities together. He searched for a middle road hoping to find common ground on issues and events. Just how would students characterize his legacy? This piece will run a minimum of 500 words and handed in for assessment. •	One of Wilfrid’s achievements centred on opening up the West to settlement. He wanted to see the creation of a great nation that stretched from coast to coast. During his tenure, some two million emigrants came and settled in the West. He presided over the setting up of Alberta and Saskatchewan as provinces. On at least two occasions, Wilfrid took extended trips out west where he stopped en route and spoke to large crowds of admirers. Is it possible to consider Laurier as the first true Canadian? Someone who straddled cultures and communities while articulating a vision for the country during his lifetime and in the future. Break students into small groups and have them discuss this question. assess prior knowledge of each topic by referring to the questions listed for “before” the lesson and “after” the lesson has been implemented. •	Do students have a general understanding of the issues concerning Francophone communities during the period that Wilfrid entered and served in politics? •	Do students have a clear understanding of the key issues affecting Francophones during Wilfrid’s time? •	Do students have any prior understanding of the concerns of the Francophone community during Wilfrid’s political career? •	Are students familiar with events such as the Manitoba Schools Question or the Rebellions of 1870 and 1885? •	Students will describe the concerns of the Francophone community during Wilfrid’s tenure. •	Students will reflect an understanding of the importance of the actions Wilfrid took to deal effectively with those issues. •	Students will determine whether Wilfrid was successful in his efforts to resolve the crises that affected Francophones across Canada. •	Do you have a general understanding of FrenchEnglish tensions during Wilfrid’s time? •	Do you have a clear understanding of the major issues that concerned Francophones when Wilfrid served in politics? •	Do you have any prior understanding of FrenchEnglish questions during this historical period? •	Are you familiar with Wilfrid as a politician who worked to bring the two communities together? Explore the Life and Times of Canada's first Francophone Prime Minister Sir Wilfridâ&#x20AC;&#x2122;s story is brought to life through compelling images that illustrate his life from childhood to his twilight years. Follow one of of most revered politicians in Canadian history and the highs and lows of his celebrated career as well as his common humanity. Key People and Themes Sir Wilfridâ&#x20AC;&#x2122;s family life; Francophone politics in Quebec and on the national stage; The tragedy of Louis Riel; the Manitoba Schools Crisis; Outbreak of the First World War; and Mandatory conscription. Teacher Resources Comprehensive suite of curriculum-connected resources and lesson plans smoothing the way for classroom implementation. Recommended for teachers and students in Grades 9-12. Available in English and French. folders, pencils, paper, and journals. The reservation school was located smack-dab in the poorest county in the United States—where 97 percent of families lived below the federal poverty line and families averaged a yearly $4,000 income. The overarching school environment stressed almost militaristic discipline and control, in an attempt to provide my students with structure they so desperately needed. Into this atmosphere, I introduced the smallest modicum of freedom and choice. I told my students they needed to write a page each day; but what they chose to write was up to them. Micco Brave Dog, a 12-year-old seventh grader, liked to write little stories featuring Indigenous protagonists for his required page-long journal entries. In one such story, which he titled “From Abandonment to Independence,” he wrote the life story of a 10-year-old Native girl named Tatunka’win. Tatunka’win lives in Lame Deer, Montana. Tatunka’win parents died in an automobile accident. She was 10 years old. Since the accident she lived with relatives all over the reservation. Her relatives are all abuse and alcohol. Tatunka’win is now in the 7th grade and she is 14 years old. She has very little support from her relatives but they all want her disability and social security checks for drugs and alcohol. Her relatives drink up her money every month. Then one day Tatunka’win met a nice lady who offered her a nice place for teen girls. Tatunka’win use the court system and move into the girls home. She had her own room, and was able to save her money and learn independence. could absorb the scrawls through intention alone. My principal had told me that the Little Thunders were a “rough” family: Hawk’s parents were in and out of jail, his older brother had joined a gang, and his sister had already dropped out of high school. “He may be the only one in his family who has a chance,” my principal said. “He wants something more for his life, and he knows education is the only way he’ll get off the reservation.” Hawk wrote in his journal: miss talamo i am so tird of death death all around me everywhere i turn i cannot escape it and i am so afraid so afraid i will lose to death. I knew about the reservation’s high death rate and low life expectancy (47 for men, 52 for women). I knew some of my students had been hit harder than others by death: Hawk, at age 13, couldn’t even count the total number of his deceased friends and relatives on both hands. I could tell that my students were bored with my lessons; my classroom instruction wasn’t cutting it. These students needed more than a first-year teacher who couldn’t properly manage her classroom and expected them to be excited over stories with clear beginnings, middles, and ends. I brainstormed ideas over the summer. I attended professional development at the National Writing Project. Make writing meaningful for students, my mentor advised. Give them incentives to learn. I returned for a second year with a re-vamped curriculum and the idea for a classroom store, where students could “buy” candy or stuffed animals or cameras or jewelry after amassing enough raffle tickets earned for attendance, class participation, completed homework, and improvement in their writing grades. The day I introduced the classroom store, Keya Walks Out—a 16-year-old seventh grader interested only in the American Indian Movement—snickered. “What am I going to do with a pink stuffed bear?” he asked me. I knew Keya was fiercely protective of his younger sisters; I asked if he could earn prizes for his sisters. He replied, “I guess” and put his head back down on the desk. Later that evening, I paused over Keya’s submitted writing assignment for the day. I had assigned the students to write an “I Don’t Understand” poem, and Keya had written two sentences, across a single line: I don’t understand why I am here on this earth. I don’t understand why God made this mistake. The classroom store, for students like Keya, wasn’t going to cut it, either. I had a break-through with Keya only by accident, when my principal put me in charge of preparing students for a county-wide speech competition. Eager for a chance to miss a day of school, Keya volunteered—for the first time in my history with him—to join the team. I let him write an expository speech about Russell Means. I was surprised by how seriously he took his writing. On the day of the speech competition, he brought home a second-place finish—and, for a very brief moment, he gave me a smile. Keya’s victory made several things immediately clear to me: my students needed to experience success. They needed to write about what they loved. And they needed to see that their writing could impact a broader audience than the one held captive each day between the four walls of my classroom. I decided I needed to celebrate my students’ writing, and that they needed to celebrate each other. I created a monthly newsletter featuring the students’ best writing, which they helped disseminate to each homeroom class. I started publishing class anthologies of the students’ writing twice a year and accepted art submissions from my students to accompany the pieces. These anthologies—along with the students’ journals—were the only school items not discarded in the giant gray trash bins left in the middle school hallways on the last day of each school year. Lex Talamo graduated with a Master’s Degree in investigative journalism from Arizona State University’s Walter Cronkite School of Journalism. She has also taught writing courses to middle and high school students. Edmonton Waste Management Centre – Edmonton, AB Book a school tour to visit Edmonton Waste Management Centre. Students will discover how recyclables are sorted, organic materials are turned into compost, e-waste is recycled, and how waste is converted into methanol and ethanol. The tour is for grades 4-12 and takes 2 hours. There is a limit of 40 participants per tour, including adults. For more information, visit: www.edmonton.ca/residential_ neighbourhoods/garbage_recycling_waste/ewmc-tours-forschools.aspx Vancouver Waste-to-Energy Facility – Vancouver, BC On this exciting tour, students will discover how 25% of Metro Vancouver’s garbage (280,000 tonnes) is turned into electricity that is enough to power 15,000 homes per year. The tours are available for grade 5-12 and they take 1.5 to 2 hours. The maximum class size permitted is 32 students. The tours are available on Wednesdays and Thursdays. On this interactive guided tour, students will learn how Guelph’s organics, recyclables, and garbage are collected and processed, and how to minimize and divert the amount of garbage we produce. Kids will be able to touch and feel recycled materials at different stages in the recycling process, see how the organic waste processing facility operates, and learn how to minimize waste at home by sorting it properly. The Education Centre is best suited for groups of 25 people or less. For more information, visit: www.guelph.ca/living/garbage-and-recycling/wasteresource-innovation-centre/waste-diversion-educationcentre. Ottawa Valley Waste Recovery Centre – Ottawa, ON The Ottawa Valley Waste Recovery Centre offers a variety of educational programs for grades K-12. Some of their programs include, a Princess and Water Fairy skit for the youngest students; learning about greenhouse gases; and becoming an electronic waste steward. The programs are run by educational staff and connect to the local curriculum. For more information, visit: www.ovwrc.com/teachers-tours-and-presentations-2. theshat teredground.com We acknowledge the financial support of the Government of Canada. Nous reconnaissons l’appui financier du gouvernement du Canada. EDUCATORS LOVE THE RUPTURED SKY! The Ruptured Sky is a digital literacy title that explores the War of 1812 from First Nations perspectives. A great resource for teaching social studies, history, literacy, and First Nations curriculum.